Garage Sale Anyone? At least signage won't be a problem? So, Kinzi and I have been lamenting the lack of garage sales in Jordan. There's nowhere to go and get nice, gently used things. You know, those things that have life still left in them but that you don't need anymore. I've gotten some awesome things at garage sales in the past (including furniture). 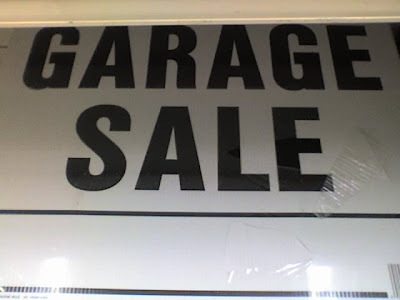 But, isn't it nice to know that if you decide to have garage sale, signs are available? I was at Safeway looking for some scotch tape, when I saw this sign. Wow, I thought, those will sit on the shelf for a LOOOOONG while. But, Kinzi, for that garage sale we're thinking about, signs are no problem. What do you get when you mix ice cream and horse manure? Tony is a "red-letter" Christian, meaning that he has a literal commitment to live out the words that Jesus said (often printed in red letters in Bibles). He loves his enemy, give to the poor, etc. Jesus transcends partisan politics. (Imagine that.) He goes on to say that that's what's wrong with the religious right, it's turned Jesus into a republican and he's not. However honestly my favorite moment in the show comes when Tony is scolding Steve for "vain recitation" at which point Steve inquires aren't you judging other right now. Tony has the grace to admit that he was and look a bit sheepish about it. Okay, so now here's a link to the clip http://www.comedycentral.com/sitewide/media_player/play.jhtml?itemId=59604. And, in parting, he likens the mixing of religion and politics in the US to mixing ice cream and horse manure. It does nothing to the manure but ruins the ice cream... Interesting thought to ponder, no? Does anything good come out of excessive pride? Okay, so Kinzi gave me Jesus Camp to watch (far too late to join the commenting on her blog) and I found something so interesting in this documentary. I'm fairly certain that the New Testament isn't really big on pride. In fact, it's talked about this many, many times and framed in many different ways. When giving charity, the right hand should not know what the left hand is doing. If you talk it up and tell everyone to gain pats on the back, you have received your reward on earth, none will be waiting in heaven. And yet, in this film, a young girl is talking about how God isn't in churches where they sit quietly and sing. He's only in churches where people jump up and down and shout (her thoughts, not mine). How prideful is that? Your way of worship is the only one. Your style is the only one. The truly ironic thing about this is that the argument goes both ways. Mainline churches for many, many years failed to respond to the younger generation (and consequently lost membership) because they couldn't see"performing" at church you know with all that contemporary music and wild hopping and shouting. Finally mainline churches have begun to see that they must give people the opportunity to connect with Christwhere the person is (not where the church elders are). And yet, this young girl is being taught (and clearly hears at home) that her way to worship is the only way. How sad... And, really, is that Christian? Okay, so I am pretty hung up on this topic :). And part of the reason is that many of the teaching aids I've bought, I got in the US. As a result, if I use them, ButterBean is learning the wrong way to write (yes that's right, there's a right way and a wrong way apparently... I'd really like to just go out and buy copy books using my system, teehee. So, today as we were using one of these aids, I decided to grab a picture, so I could complain with visual aids (ha!). So, here's a comparison, side by side shot of just the lined paper and then with a letter on it. See, tell me THIS isn't confusing. On the left with the two heavy lines and the two dashed lines is the system they are using. So, the second dashed line is actually the bottom line (where all capital letters and most small letters end). The bottom heavy line is where the below-the-line letters go (p, g, q). On the right is MY paper, what I grew up using. As you see, the top heavy line is where the capital letter starts. The middle line is, well the middle, so where small letters reach at the top. The bottom line is (get this) the bottom of all big letters and most small letters. So, the letters mentioned above that hang below go (okay, wait for it.........) below the line! Both of these are SMALL letter ps. Okay, is there ANYONE out there who doesn't think the one on the right makes more logical and obvious sense? Anyone? Anyone? THAT'S what I'm talking about, right there. I think I may have to work on this from the other side. I'll try talking with the elementary school administrators and see if I can bring them into the fold of an obviously better system, teehee. Talk about much ado about nothing... Given the fact that it was seeming decidedly less than snowy last night, I set my alarm as usual to get up and get the beans (and myself) ready for school. I looked out the window and saw no snow on the ground. And, so, I determined that we should go ahead and get ready, I mean who would cancel school with no reason. Ahhh, you'd think I'm not from Alabama. There they would cancel school due to the "threat of inclement weather." Yes, that's right if it seemed like it might get a flurry or two, they'd cancel school. And so, TetaBean called to alert us to the fact that school was cancelled. And then my school called to say that since all other schools are cancelled they had no choice (parents and teachers would have nowhere for their kids to go). So, here we are at home with no snow. How is that fun? I'm sure El 3atal and I will end up heading out on errands today, but I do find it funny that everything is cancelled because of the snow. A friend said she thinks they cancelled school out of disappointment that the snow didn't materialize :). While doing our Christmas shopping this year, I was shocked by the lack of any Lego sets on the shelves at Wal-Mart. When I asked an employee, they took me to the smallest little section of the toy department and said that the last ones they had had were in this section (the building section). There was only one sad little box of Lincoln Logs. Now, don't get me wrong, I like Lincoln Logs and I bought them, but it wasn't what I was looking to purchase. I had promised Junior Bean that we would try to get him the super cool Pirate Lego set we saw advertised on TV. No such luck. As I got home, I mentioned to MemeBean the scarcity of Legos. She responded that she seemed to recall reading that they had either gone out of business or been bought out, so maybe that explained it. This morning, talking to Kinzi, I was reminded of this and used my best friend google to get to the bottom of the matter. Here's what I found. The article talks about how kids are wanting more and more gadgets and fewer building toys. How sad is that? Do we really need another Princess pretend cell phone? A set of keys that chirp? Another gadget or gizmo? Where does the learning come in? In my house, we need fewer, not more. We have plenty of cute little pretend cell phones. And, while I fell trap to the trend and got the kids games for their V.Smile for their birthdays, at least they are educational. And, I can't buy Legos. What's a mom to do? The article notes that competition from brands like Mega Blocks with a lower cost structure has hurt Lego. In addition, they spent lots of time chasing trends rather than focusing on their core business. Now, again, don't get me wrong, I like Mega Blocks. In particular, they're the only ones out there that I've seen making Lego-style blocks for little ones (under 3). But, in their range for older kids, they haven't moved into the neat sets where you can build a pirate ship and an island... They just aren't Legos. So, reason #2 that I blog is the ability to make connections with other people. Since moving to Jordan, I have met the most awesome people through blogging. I've found other gals from Alabama (like the one who tagged me: see below) who help prove that no matter the religion, people are fundamentally the same. Good people are good people, anywhere in the world. 2. List 6 actions or achievements you think every person should accomplish before turning 18. 3. There are no conditions on what can be included on the list. 4. At the end of your blog, choose 6 people to get tagged and list their names. 5. People who are tagged write their own blog entry with their 6 suggestions. 6. Don’t forget to leave them a comment telling them they’re tagged. 7. Optional: You can include the image of the ridiculous Reese’s Puffs list in your post as a reference. Spend at least one month learning about life from someone else's perspective (do a service learning project and live among people of different circumstances, be part of a Model UN, see what life is like for oter people. Love someone. I mean really, give someone your heart whether or not they give you theirs. Serve others in a soup kitchen, retirement home, orphanage, wherever those who are less forunate are likely to be. Get a job. And, I mean the kind of job nearly every American youth has at some point, the type that is mind numbingly boring but teaches you about earning money of your own and how hard it is. That's a before 18 list. Before 30 would look very different, but it is what it is. I guess I'll tag El 3atal, Kinzi, Hala, Salam, Dave, and Jad... I look forward to reading your lists and am so glad that we've made connections. So, this week was supposed to be a week to blog about why I blog, but life has gotten in the way. And, maybe that gives me my starting point for this conversation with myself. I blog to order my thoughts. My thoughts about life, about business, about society, about myself - all are fair game. Honestly, much of the conversation on my blog is with myself rather than my readers (all 2 of them :)). So what is all of this introspection good for? I think as an American from a specific type of family (that is, one that likes to argue), I was raised with the belief that thinking is valuable in and of itself. The process of thinking about my beliefs on any given topic lead to one of two outcomes. Outcome 1: My belief is strengthened and my ability to articulate it solidified. Outcome 2: My belief is challenged and new thoughts begin to emerge. Both of these are very positive outcomes. Many of my relatives have kept journals, wonderful books that chronicle their lives, thougts, and feelings. They refer back to them periodically to see what they can and have learned during the intervening time. For me, finding the time to sit down with pen and paper is nearly impossible (ironic for someone who prefers books in physical form, can't process anything they read on the computer and prints everything in the world to read it!). I've gone through stages of up to about 2 months when I kept a journal, but always found something got in the way. Unlike the blog, once I dropped it for a few days, I found it nearly impossible to get into the swing again. Blogging, for me, can come and go and still is there in the back of my mind. So, introspection is sort of inbred, but for me, the outward nature of blogging facilitates introspection (how odd is that?). Stay tuned for more reasons I blog (and I apologize for any spelling errors as blogger is not functioning properly with spell check and I never have the time to do it manually). We Are All Fouads: Are we really? As I found out from Kinzi's blog (where I get 70% of my blogosphere news, where DOES she find the time! ), there is a week of support for Fouad Al-Farhan, the Saudi blogger who remains imprisoned without charges to date (since December 11, 2007). Although I have never met Fouad and can't read his blog, I am proud to support the "We Are All Fouads" week this week. So, I wanted to explore that theme just a bit below. They asked that we copy a post form his blog and then track back (okay I'm an old lady too so not sure how weel I'll do at part two, but I'll ifgure it out or something). I was told that there is an official order from a high-ranking official in the Ministry of the Interior to investigate me. They will pick me up anytime in the next 2 weeks. The issue that caused all of this is because I wrote about the political prisoners here in Saudi Arabia and they think I’m running a online campaign promoting their issue. All what I did is wrote some pieces and put side banners and asked other bloggers to do the same.he asked me to comply with him and sign an apology. I’m not sure if I’m ready to do that. An apology for what? Apologizing because I said the government is liar when they accused those guys to be supporting terrorism? So, now, how are we all Fouads (in my mind)? 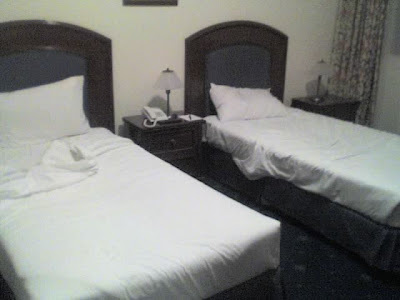 You know, I find that there is a companionship, a commonness and sameness among bloggers. Each of us has something to say. Each of us takes the time to say it. Whether we're paid journalists, amateur writers, young people coming into our own, we're all trying to put down on virtul paper our thoughts and feelings down. And, I have to admit, that I feel Fouad's last wish is one that causes most of us to blog, " I don't want to be forgotten." Blogging provides a sense of community in addition to the commonality. It brings together people who share something, a willingness to put themselves out there. We build friendships and frenemy relationships with others who blog. We comment and it gives us the chance to belong to something greater than ourselves. In this way, We Are All Fouads. Even though we are part of a community of virtual peers, we are often physically alone. Occasionally we may meet other bloggers, may even become friends, but blogging isn't a team sport. So often, we're blogging about the things closest to our hearts without physically knowing the people who read, comment, and care what we have to say. Those who blog with constructive feedback and destructive critcism alike are change agents in their societies. They raise issues that are distinctly uncomfortable. Some manage to do so with humor, others with tears, but all of us are catalysts for change. Change is almost always painful and we often experience the pain (physically and mentally). Like Fouad, we provoke thought and change. Happy We Are All Fouads week! I mean, we all know that it's month first and then date. But, then, here in Jordan (and everywhere outside the US to be fair) that would mean you have 31 months! Although that does sound like fun, it's a bit impractical. So, you canimagine how funny this ad looks to me. 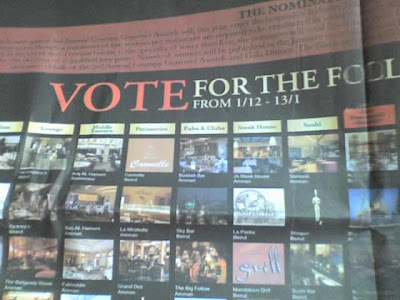 Is the voting going on from the 12th of January until the 13th? Or until the 1st of the 13th month? After quite a bit of time trying to figure this out, I realized that it was from December first until January 13. (Cut me some slack the paper was a January paper, so who'd expect the first visible mention to be IN January for a contest that started in December?!) This just illustrates why the American way is better (teehee). Actually, since moving to Jordan, I've simply stopped using numbers and write out the month names :). Saves the confusion of having a birthday in the 22nd month. And, on another date related note, while in Arabic class the first week we used our birthdays to practice saying the numbers properly (read that backwards). We went around the first time and then came back around. On the second go round, one of my fellow students admitted that she had lied about her birthday. She said March 9th because she couldn't remember the Arabic word for eight! I'm all for that myself, I'll just make up important dates based upon the numbers I can actually remember! Okay, I know some of you think I only have a sense of humor about the abuse of English that occurs in Jordan. To prove this isn't the case, while in the UAE, I couldn't help grabbing a picture of this. That's right ladies and gentlemen, introducing HEET WATER! 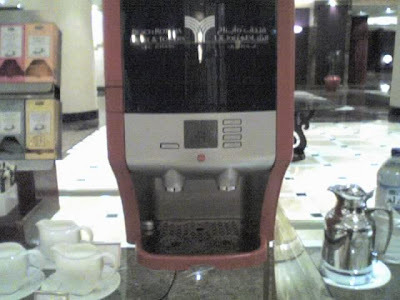 It features prominently on this coffe machine at the very fancy hotel where we had our meetings (and we won't talk about the difference between the roach motel we stayed in and this one, teehee). And, let's be honest with ourselves, they just made this word up. Maybe someone who only knows how to spell feet came up with it. Since heat is ea not ee. 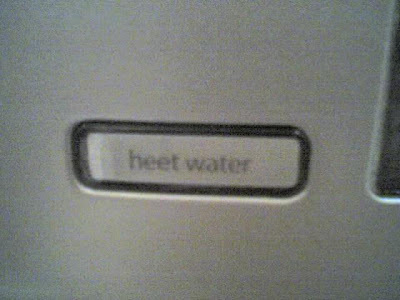 So, even if they were going to do it wrong (heat water), they shouldn't have come up with this :). I mean really, would YOU live in a place without internet access...? Neither would I. And, yet, apparently that's what many people living in the self-styled Apartment Hotel in Abu Dhabi are doing. El 3atal and I were there on business and they had no internet access! When OfficeMate bean asked about the business center mentioned in their literature, they pointed her to the internet cafe ACROSS THE STREET. And, not just a small street but a six lane divided monstrosity. Adding insult to injury, the remote control for th TV didn't work. So, after two night of trying to change it and one night changing the TV altogether, we finally got them to just change the silly batteries and it worked just fine - for our last night. So, anyway, if you have the chance to visit Abu Dhabi's City Seasons hotel, pass. Do not fall victim to this yucky place. I came across an interesting article about the fact that people with blue eyes all come from the same common ancestor. In the article below, they talk about a research study that has been done with people in Denmark, Turkey, and JORDAN. How interesting. They looked at mitochondrial DNA of blue-eyed people in the three countries and found that all of them were from the same mutation between 6,000 and 10,000 years ago. So, I guess maybe people aren't as foolish as they sound when they say that El 3atal and I look like siblings!